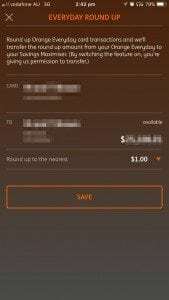 ING Australia has recently informed customers of a new savings service called Everyday Round Up, which is nearly identical to the Acorns investment model. It’s a great offering that I think will help customers get saving. Is it worthwhile though? 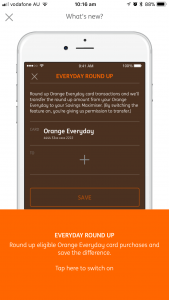 Everyday Round Up is an optional service for customers that hold both an Orange Everyday bank account and a Savings Maximiser bank account. The goal is to save the change by rounding up your Orange Everyday purchases to the nearest dollar and transferring the change into your Savings Maximiser account. 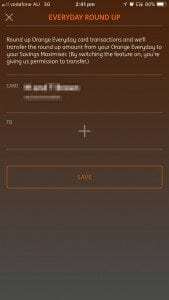 Switching it on is as simple as the press of a few buttons in the ING mobile app, and once it’s running your saving begins. 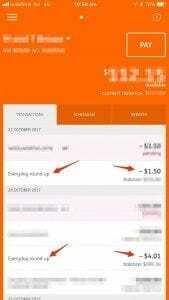 Turn on ING “Everyday Round Up” from within the ING app by tapping the arrow by your ING Everyday account. Select Everyday Round Up from the menu that appears. Once you select the account you want to use to round up from and to, you can choose whether to round up to the nearest dollar or the nearest five dollars. Tap the + to select what savings account you will be rounding up to. Tap “Select” to choose your round up amount. Choose how much to round up, to either the nearest $1 or $5. Once you’ve chosen your round up, tap the save button. Every time you make a purchase, the difference to the next dollar or five dollars is put into your savings account. Once it’s there, it begins counting towards your balance for interest calculations immediately. 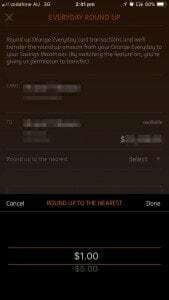 This is how the round ups appear in your statement. These ones were rounding up to the nearest five dollars. Interest is calculated daily and paid monthly on the balance of your Savings Maximiser account based on the current interest rate as indicated on the ING website. So every cent you add will help you reach your savings goal quicker. This is especially true if you also have more than $1000 deposited into your Orange Everyday account each month so you get the bonus interest on your Savings Maximiser account. If you aren’t regularly saving or investing money then this is a great tool to help you towards your savings goals. It’s important to remember though that at the end of the day, no matter how much you spend, it’s only going to be a matter of cents that are saved on each purchase if you round up to the nearest dollar, so it will not be a significant amount you save. For comparison, I’ve been using Acorns, which functions on round ups as well, since it’s launch in February 2016 and so far, in 20 months with it rounding up based on every account my wife and I have, including my business account, it’s only invested $3,188. So even putting every purchase you make on your Orange Everyday card, it is still not going to be heaps that you save. The five dollar round up option though is a slightly different story. By using that option you could potentially be saving up to four dollars more for each card transaction, and that can add up quite a bit faster. As the saying goes though, “from little things, big things grow.” It is important to start somewhere, and if you don’t have a regular savings plan, then this is absolutely a great way to start saving. Yes, it is worthwhile if you are not already saving regularly. No actions required after you turn it on. One of the highest bank interest rates around at the moment (if you are earning the bonus interest as well). 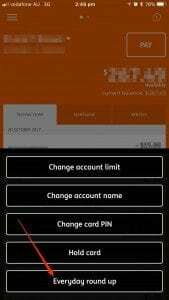 No new accounts required if you already have an ING Orange Everyday and Savings Maximiser. 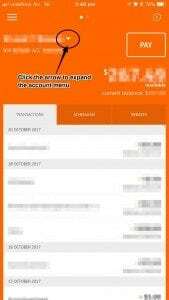 Can automatically open a Savings Maximiser account from the ING app if you only have an Orange Everyday account. Can round up to the nearest dollar or nearest five dollars giving you an option to save faster if you can afford it. Money saving that you don’t have to think about or plan. Great for those that struggle to put money aside. Small amounts are saved at a time making it less of an impact on your weekly budget than a large sum. Easy to get the money out if you need it – just transfer it back to your Orange Everyday account. Low ROI compared to other investments. Must deposit $1000 per month into your Orange Everyday account to receive bonus interest. Only rounds up from your Orange Everyday account card transactions, not from bank transfer/Bpay transactions or other accounts. Easy to get the money out (a con if you have trouble saving because it is too easy to spend the money before reaching your goal). The missing dash in the name will annoy you everytime you see it (or at least it annoys me anyway). Are there better round up services? At the end of the day, your highest possible return from the ING Savings Maximiser will always be the current interest rate plus bonus interest rate. At present, this is extremely low. At the time of rating, the current interest rate is 1.35% and the bonus interest rate is 1.45% so the total possible interest you can receive is 2.80%. The Raiz app uses account roundups in the same way and began offering an Australian roundup based, managed investment portfolio in February 2016 as Acorns Australia before later rebranding to Raiz. This service leverages managed funds across a variety of markets including the Australian and international share markets, government bonds, the money market and more. As such, these portfolios have the potential to earn much higher returns. Of course, this type of investment is also subject to market volatility meaning you may not see a return every month. However, in the 20 months since I began utilizing Raiz, my average ROI has been above 8% pa, often sitting between 10% and 12%, much higher even at the lowest end than the current bank interest rates. You can find out more about how Raiz works in my blog post here, but there are different portfolios depending on your risks aversion. Some offer much greater security with decreased risk of loss, but lower returns, while others offer greater returns with a higher risk of loss. In my opinion, this is a much better service because it allows you to easily and cheaply invest in higher return markets, helping you to reach your savings goal faster. That said, it is important to note that these markets are long-term investments, not short term. Long-term is necessary as it will enable your investment to ride out the occasional losses and increase overall.